FORWARD to Professorship in STEM: Inclusive Faculty Development Strategies That Work provides best practices on how to design and implement inclusive workshops aimed at supporting faculty and staff in their career development. 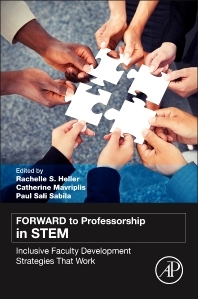 The book addresses fundamental skills and strategies to excel in academia, with a focus on assisting women and other underrepresented groups to succeed in obtaining tenure-track faculty positions, and in acquiring tenure. Contributors from wide geographical, disciplinary, and career backgrounds offer their insights on challenges in academia, lessons learned, successes, and outcomes, with chapters devoted to tenure and beyond, collaborations and funding, impact on, and of, the deaf culture, and engaging differences. Those pursuing or involved in a career in the STEM fields, including students and academics as well as university administrators and industry professionals. Additional markets include academic and professional women’s organizations and those involved in professional development training and workshops. What was Learned from the First Workshop? Why are Workshops for Women Needed? Faculty Developmentâ€”How Are Existing Models Faring? How Are Faculty Development Models Evolving? What Is the Future of Faculty Development?